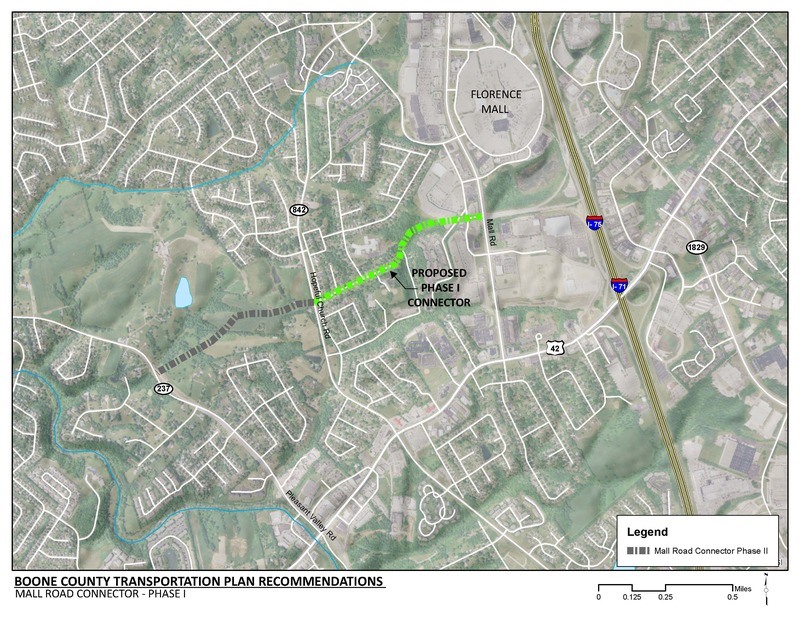 Perform a scoping study to determine the preferred alignment and phasing of approximately 1.4 miles of new roadway and multi-use path from Mall Road to KY 237 (Pleasant Valley Road) to provide an alternative route to congested arterials in the western Florence and Oakbrook areas. Implement the first phase identified in this study from Mall Road to KY 842 (Hopeful Church Road). The Mall Road connector project will serve as a collector route to provide a direct connection for vehicles, pedestrians and bicycles from residential developments in the Burlington and Florence areas to the Mall Road commercial district. East-west mobility through central Boone County will be improved by providing this new route. The new route is expected to reduce the traffic demand on US 42 and KY 18 (Burlington Pike). The project area is adjacent to existing parks, schools and homes. Impacts to these areas will need to be avoided and/or mitigated. Currently, the only direct connection for vehicles and pedestrians in the project area to the Mall Road district is through KY 18 (Burlington Pike) or US 42. Other options include the use of a disjointed connection through residential streets along the northern side of the area which were intended only for local traffic. As delay on KY 18 (Burlington Pike) and US 42 increases from growing traffic volumes, more drivers may choose to use the residential streets as an alternative route. The proposed roadway will serve existing residential developments in the Burlington and Florence areas. The Yealey Elementary School is located on Yealey Drive in Florence, Kentucky and adjacent to the project area. Lincoln Woods Park is accessed from Lincoln Woods Drive and is adjacent to the project area. There are existing sidewalks along residential streets in the project area.